One of my favourite ways to cook salmon in the fall is on a soaked cedar plank – the rich smoky flavours somehow seem fitting to the cooler weather. It’s also a great staple recipe to serve a crowd and wow your guests when presenting a whole side. Although using a cedar plank is now a popular technique for grilling, it was quite a novelty in the early 90’s. In my past life as a restaurateur, I can recall the puzzled questions when I would place my order for one hundred, eight inch slates of untreated cedar at my local hardware store. We would soak the wood overnight in water and then serve on the plank with a blended cream cheese and horseradish. An unusual combination but remarkably delicious! I was recently re-inspired – at the International Cool Climate Chardonnay Celebration – with a new twist on this now classic preparation for salmon. 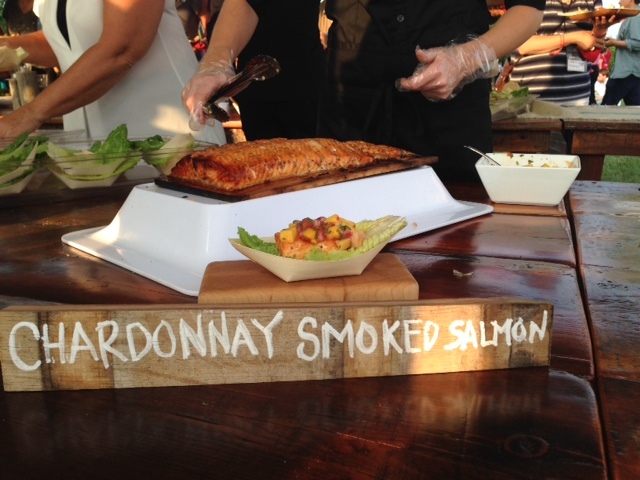 Here, chefs used ‘Chardonnay’ wood chips to smoke the salmon. The result is a delicate, sweet-smoky flavour infused into the fish, perfectly balanced by a yummy mango and peach salsa. Alan and Anne of Pig Out Roasters indicated they purchased the chips pre-soaked in wine but I recommend soaking your plank in a shallow pan of your favourite ‘cool’ climate Chardonnay from Ontario. Pair the rest of the bottle with the meal and you will be sure to fall for Chardonnay – maybe for the first time or all over again. Fresh Atlantic salmon from the East Coast 2/3 lb per side. Wash the Salmon fillets and remove any small bones using tweezers. Pre soak the Chardonnay infused cedar planks for at least 2 hours. Brush the marinade over the fish thoroughly. Place salmon on pre-soaked plank and cook in closed barbeque 15-20 minutes depending on the thickness of your fish. Serve with fresh mango and peach salsa. Mix all of the ingredients together and allow time for the flavours to marry.